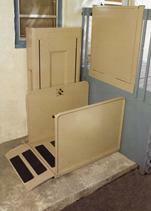 Residential wheelchair lifts are an affordable solution when stairs become an obstacle. Access to your home without unsightly, space consuming ramps. You will never have to shovel snow and ice down a slippery slope. Lifting heights of 24", 42", 60", and 72". Converta Step is constructed of heavy, weather coated steel that can lift up to 750 lbs. The lift raises in 8-15 seconds and is 31" wide to accomodate most chairs. This economical solution for your residence replaces the larger, bulkier wheelchair lifts. The lift comes in 3 sizes and is adjustable from 1 to 5 steps. It can also be painted to blend with any home exterior.